Wanna put some fun back into advertising? Sure ya do! Remember when advertising used to be, dare I say it, fun? We actually enjoyed working in this industry. And, I’m not even talking about our three-martini lunches! The work. The creativity. Client interactions. Clients actually willing to work with us. I know. Sounds like it’s all from a galaxy far, far away. Well, not quite. You’re invited to come join AAF-Houston on Wednesday, May 16, for a special appearance by a renowned creative from The Richards Group in Big D, Chris Smith. Come be our guests and learn how to put some fun back into your advertising. Feel free to register right now! If you live and work within driving distance of Houston, you owe it to yourself to come spend a day or two listening to and learning from Adobe’s experts as they teach all you need to know about the various applications within the Creative Cloud. As the one stop source for finding creative talent in the Houston area, Only in Houston (OiH) is proud to be take part in presenting this Creative Cloud Masters Conference. Thanks to a partnership with Future Media Concepts, OiH members can now save 25% on their registration. Use promo code OiH15 to redeem your discount. A must-attend event created for graphic designers and other creatives to perfect and diversify their skills. Join top industry speakers to learn the latest Adobe print and web design tools, plus get started in video production. The conference agenda features 3 days of training on graphic design, print, web design and motion graphics. Organized in Houston on March 11-13. Use discount code OiH15 to save 25% on your registration. The advertising community in Houston recently lost a good friend. Rich Klein passed away Sunday, October 12, 2014. This blog is a big believer in creativity and nurturing that in students and young professionals (and pros from all age groups for that matter). Rich was a valiant supporter of young people’s dreams and aspirations, and encouraged many to enlist in the advertising profession. Rich’s passion for the advertising industry was unparalleled; he mentored literally thousands of advertising professionals and with his partner, Bill Fogarty, built an advertising agency that attracted clients from coast to coast bringing national attention to the Houston advertising industry. Rich and Bill won national and regional clients such as Chef Boyardee, Ranch Style Beans, Waste Management, Advance Auto Parts, Popeye’s, Builders Square, Mattress Firm, BFI, Randall’s Supermarkets, Shiner Beer, Mission Foods, Amegy Bank, ConocoPhillips and many others. Rich and Bill nurtured the industry’s future with a highly competitive internship program with teams of college students that would actually get to present their own strategies, plans and creative to real clients. Rich was recognized as a Southwest Advertising Hall of Fame member, AAF-Houston Silver Medal award winner and Living Legend. Rich and Bill began giving scholarships to qualified college students in 1991 and later established the Rich Klein and Bill Fogarty Communications Scholarship within the Advertising Education Foundation of Houston where Rich became Chairman leading the foundation to unprecedented growth. This year Rich and the Foundation awarded $30,000 in advertising scholarships to students throughout the Southwest. From the unlikely pairing of a seasoned packaged goods brand manager and an ex-journalist-turned advertising maven it has been a long voyage from the day Rich Klein had to break it to Bill Fogarty’s wife that the pair was leaving their jobs to start a business with no business in hand. Lucky for advertising in the Southwest, Rich Klein and Bill Fogarty stayed true to their vision and made it happen, creating the best, darn agency in Houston, one with a rich legacy of innovation and accomplishment, integral community work, and programs to inspire future ad folks like themselves. I would encourage all who may read this to consider donating to this very worthy scholarship. Thanks for reading and your interest. Thank you, Rich, for your advice, friendship and guidance over the years. We’ll miss you! Those of you in and around Houston are in for a treat. Register now for this Wednesday’s American Advertising Federation Houston’s Speaker’s Series Luncheon. 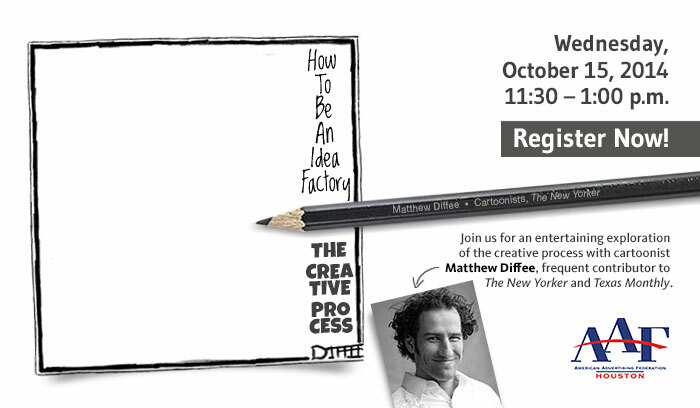 It features cartoonist Mathew Diffee, frequent contributor to The New Yorker and Texas Monthly. Working and interacting with students, especially those of college age, is always interesting, entertaining and fun. 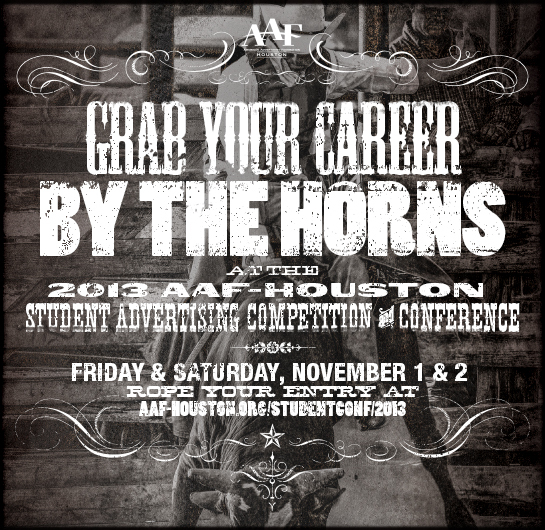 Recently, I had the privilege of volunteering as a portfolio and resume reviewer during the annual American Advertising Federation Houston Student Conference. This is usually the prelude to the AAF District 10 NSAC (National Student Advertising Competition). As with past years of doing this, my table quickly filled as students wanted me to review, comment and answer questions regarding their portfolios. The scene was the same at other tables set up in our hotel ballroom. This was cool, I thought. Then it hit me, “How in the heck was I going to cater to these students given the one hour allotted?” I told them I would give them all my attention if they were willing to wait for it – even to the end of the conference. And they did! Like sponges, ready to soak up every last bit of information and critique they could get. Bless their little advertising hearts! Like with some client presentations, some students (agencies) were better prepared than others. Technology is to blame for some of this. We get so caught up in what we’ll present, that we forget HOW we’re going to present. A “Plan B” didn’t seem to be part of the homework for some of these folks, no matter how well-intentioned. That’s okay. I made it known how they could be better prepared. One needs to make the presentation as simple and engaging as possible. There’s no time to go searching for that now-illusive mp3 recording of your radio ad. Have them in one file for easy and quick access. And, have the script standing by just in case. Along these lines, I strongly suggested they have a PRINT portfolio readily available, in addition to their digital files. One never knows when the power will go out or if the person to whom you’re presenting actually wants to touch and feel the work sample in their own hands. I suggest this for both students and non-students (the rest of us) as well. Contrary to popular belief, digital is not the end all. Some of the young people had better explanations of their work, and why it was included, than others. Most wanted to know if their samples were good enough to be included, and how many samples they should include. While all seemed to know precisely what they had included in their portfolios, I did not get a sense they knew their work “cold.” I suggested they be prepared to present it upside down while standing up. That’s just impressive when that’s done. Now, I realize this form may be a little tricky to do when presenting digital samples from an iPad, but one should know about each piece and what’s special about it – why one is presenting it. All in all, the students were very gracious, respectful, and personable. We all had a wonderful time. They’re smart enough to realize that no matter one’s age, how one presents one’s creative credentials is just as important, if not more so, than the work itself. Believe in yourself and convey that. Let your passion show. We should all be involved in this continuing education and refining of not only what goes in our portfolio but how we present it. These students are off to a very good start, which bodes well for the future of advertising.